The book start is extremely nice and it grabbed my attention. I have listened to the first 90 minutes in one session. However as I proceeded with the book it became lets interesting. The book idea is how to make your passion a money generator! how to cash from doing things you’d love to do. 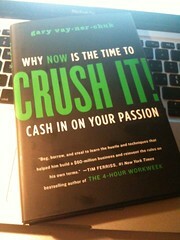 The book claims that whatever your passion is, you should be able to cash in on. The book stresses on the idea of building a personal brand and highlights this as a necessity. Which I believe is also very important. This makes social media an indispensable tool for building this brand through genuine communication and building personal relation with your customers, fans and followers. My favorite chapter is 12. Where the author illustrates that PR (Public Relations) are a disaster! Which I totally agree with. They make communication completely artificial and non-human to big extend. Making a typo is not really a big deal as they portray it. Opening the communication between employees and customers definitely helps in building healthy relations. It also motivate the employees to work harder and better as they feel that they are touching others lives. I have personally witnessed this and I totally agree. Another point I agreed with the writer on is that Google Wave will be the next disruptive technology and I blogged about it. Unfortunately, it turned out that we were both wrong. Overall I found the book interesting. It’s not one of the best books I read. However if you’re one of those who reads a lot, it’s worth reading.